Rabbi Yitzhak Zuriel has been enjoying guiding students in how to learn and understand Talmud at WebYeshiva.org since its founding. He began his teaching career as a teacher and educational director at Michlelet Bruria in the 1980s. For over 20 years, he has been working as a software engineer at the company NDS (now Cisco) in Jerusalem, and was an editor and contributor to NDS's Torah journal, Chiddushei Torah@NDS, that was published annually from 1996-2014 . He and his wife reside in Ma'ale Adumim and are parents to five children and 13 grandchildren. We will be learning Masechet Bava Kama this semester, beginning with the ninth chapter, HaGozel Eitzim. We will cover the discussions of the gemara itself, as well as the comments of Rashi and Tosafot. We will emphasize a methodological approach to studying gemara, aimed at equipping the student with the tools needed to learn gemara on one’s own. We will examine the passages in the gemara Masechet Pesachim, and in later sources, of our practice at Seder night in setting aside and only later eating the Afikoman. We will be learning Masechet Bava Kama this semester, beginning with the eighth chapter. We will cover the discussions of the gemara itself, as well as the comments of Rashi and Tosafot. We will be learning Masechet Yoma this semester, on the topic of Yom Kippur. We will cover the discussions of the gemara itself, as well as the comments of Rashi and Tosafot. We will be learning Masechet Ta'anit this semester. We will cover the discussions of the gemara itself, as well as the comments of Rashi and Tosafot. As in the past, we will emphasize a methodological approach to studying gemara, aimed at equipping the student with the tools needed to learn gemara on one’s own. Torah learning on WebYeshiva.org in Spring Semester 2017 is dedicated in the memory of Yehezkel and Sarah Lemel z”l by their loving family. יחזקאל בן אשר למל ושאשא יוכבד ז”ל ושרה מניה פייגע בת יום טוב וטשארנה רבקה ז”ל Click here to learn about their inspiring stories and passion for Torah education and Israel. To find out more about dedication opportunities with WebYeshiva.org please contact office@webyeshiva.org. In these four sessions we will learn sugyot from the Gemara Rosh Hashana and Yoma that develop the concepts of Divine Providence and Divine Judgment and the relationship between them. We will be learning Masechet Berachot chapter 5. The subject matter is highly relevant to our religious life: it is about tefila - prayer. The gemara in this chapter presents an interesting combination of spiritual ideas and concepts together with halachic content about how we are expected to pray. We will cover the discussions of the gemara itself, as well as the comments of Rashi and Tosafot. As in the past, we will emphasize a methodological approach to studying gemara, aimed at equipping the student with the tools needed to learn gemara on one's own. We will learn parts of the sugya in the first chapter of Masechet Pesachim, about the requirement to search for chametz. Through the discussions of the gemara, and comments of Rashi and Tosefot, we will gain a deeper understanding of the reasons why we need both to search and clear our premises physically of hametz (bedikah), and also to nullify it (bitul). We will also understand better some of the specific halachot of this mitzvah. The season between Pesach and Shavuot confronts us with a group of new national holidays (Yom HaShoah, Yom Ha'Atzmaut, Yom Yerushalayim) that are marked in the State of Israel and in Jewish communities abroad as well. It would appear that our daily siddur does not offer us too much in the way of prayers to recite for these occasions. But is this really so? What values and attitudes towards Jewish national life are reflected in our daily prayers? In this two-session minicourse we will uncover answers to this question. In this class we will take an in-depth look at the Slichot prayers to gain a greater understanding. What are we saying? What are we trying to accomplish through these prayers? A basic-level gemara course that aims primarily to improve the student's ability to logically parse a gemara sugya. Later on in the semester, the shiur will begin to focus more on understanding Rashi's approach as a commentator and innovator. Some of the comments and innovations of Tosafot will also be included as time goes on. The shiur is appropriate for students with a range of backgrounds who want to improve their skills working with a page of gemara, and at the same time want to be able to participate in the gemara's world of midrashic understandings of the written Torah, halachic discussion, and aggadic ideas. Prior general background in Jewish studies is helpful, but not essential. This semester we will be learning a portion of Masechet Megilla. This course has been dedicated in loving memory of Mrs. and Mr. Judith and Maurice Kandel, by the Kandel Family. A basic-level gemara course that aims primarily to improve the student's ability to logically parse a gemara sugya. Later on in the semester, the shiur will begin to focus more on understanding Rashi's approach as a commentator and innovator. Some of the comments and innovations of Tosafot will also be included as time goes on. The shiur is appropriate for students with a range of backgrounds who want to improve their skills working with a page of gemara, and at the same time want to be able to participate in the gemara's world of midrashic understandings of the written Torah, halachic discussion, and aggadic ideas. Prior general background in Jewish studies is helpful, but not essential. This semester we will be learning a portion of Masechet Megilla, starting with Chapter 1. A basic-level gemara course that aims primarily to improve the student's ability to logically parse a gemara sugya. Later on in the semester, the shiur will begin to focus more on understanding Rashi's approach as a commentator and innovator. Some of the comments and innovations of Tosafot will also be included as time goes on. The shiur is appropriate for students with a range of backgrounds who want to improve their skills working with a page of gemara, and at the same time want to be able to participate in the gemara's world of midrashic understandings of the written Torah, halachic discussion, and aggadic ideas. Prior general background in Jewish studies is helpful, but not essential. This semester we will be learning a portion of Masechet Shabbat called "Kol HaKeilim" which discusses the laws of forbidden objects on Shabbat. We will use text selections from the Rambam's Mishne Torah (primarily Hilchot Melachim but also Hilchot Yesodei HaTorah) in order to understand his concept of the Messianic Era and also what it implies for the individual Jew and the entire Jewish people in the here and now. A basic-level gemara course that aims primarily to improve the student's ability to logically parse a gemara sugya. Later on in the semester, the shiur will begin to focus more on understanding Rashi's approach as a commentator and innovator. Some of the comments and innovations of Tosafot will also be included as time goes on. The shiur is appropriate for students with a range of backgrounds who want to improve their skills working with a page of gemara, and at the same time want to be able to participate in the gemara's world of midrashic understandings of the written Torah, halachic discussion, and aggadic ideas. Prior general background in Jewish studies is helpful, but not essential. This semester we will be learning a portion of Masechet Sukkot, starting with Page 8. A basic-level gemara course that aims primarily to improve the student's ability to logically parse a gemara sugya. Later on in the semester, the shiur will begin to focus more on understanding Rashi's approach as a commentator and innovator. Some of the comments and innovations of Tosafot will also be included as time goes on. The shiur is appropriate for students with a range of backgrounds who want to improve their skills working with a page of gemara, and at the same time want to be able to participate in the gemara's world of midrashic understandings of the written Torah, halachic discussion, and aggadic ideas. Prior general background in Jewish studies is helpful, but not essential. This semester we will be learning a portion of Masechet Megilla, starting with Chapter 3. A basic-level gemara course that aims primarily to improve the student's ability to logically parse a gemara sugya. Later on in the semester, the shiur will begin to focus more on understanding Rashi's approach as a commentator and innovator. Some of the comments and innovations of Tosafot will also be included as time goes on. The shiur is appropriate for students with a range of backgrounds who want to improve their skills working with a page of gemara, and at the same time want to be able to participate in the gemara's world of midrashic understandings of the written Torah, halachic discussion, and aggadic ideas. Prior general background in Jewish studies is helpful, but not essential. This semester we will be learning a portion of Bava Metzia. A basic-level gemara course that aims primarily to improve the student's ability to logically parse a gemara sugya. Later on in the semester, the shiur will begin to focus more on understanding Rashi's approach as a commentator and mechadesh (innovator). Some of the comments and chidushim (innovations) of Tosafot will also be included as time goes on. The shiur is appropriate for students with a range of backgrounds who want to improve their skills working with a page of gemara, and at the same time want to be able to participate in the gemara's world of midrashic understandings of the written Torah, halachic discussion, and aggadic ideas. Prior general background in Jewish studies is helpful, but not essential. This semester we will be learning a portion of Masechet Shabbat called Klal Gadol. A basic-level gemara course that aims primarily to improve the student's ability to logically parse a gemara sugya. Later on in the zman, the shiur will begin to focus more on understanding Rashi's approach as a commentator and mechadesh. Some of the comments and chidushim (innovations) of Tosafot will also be included as time goes on. The shiur is appropriate for students with a range of backgrounds who want to improve their skills working with a page of gemara, and at the same time want to be able to participate in the gemara's world of midrashic understandings of the written Torah, halachic discussion, and aggadic ideas. Prior general background in Jewish studies is helpful, but not essential. In Elul we will be learning a portion of chapter 1 of Masechet Rosh HaShana that contains important sources on the nature and meaning of Divine judgement in general and at this time of year, and the implications for ourselves. A basic-level gemara course that aims primarily to improve the student's ability to logically parse a gemara sugya. At the start of the semester, the emphasis will be almost exclusively on reading the gemara text, and using parallel gemara sources for understanding specific concepts. Rashi's commentary will be used only sparingly, for informational purposes. Later on in the zman, the shiur will begin to focus more on understanding Rashi's approach as a commentator and mechadesh. Some of the comments and chidushim (innovations) of Tosafot will also be included as time goes on. The shiur is appropriate for students with a range of backgrounds who want to improve their skills working with a page of gemara, and at the same time want to be able to participate in the gemara's world of midrashic understandings of the written Torah, halachic discussion, and aggadic ideas. Prior general background in Jewish studies is helpful, but not essential. This semester we will be studying Tractate Makot, Chapter 1. A basic-level gemara shiur that aims primarily to improve the student's ability to logically parse a gemara sugya. At the start of the zman, the emphasis is almost exclusively on reading the gemara text, and using parallel gemara sources for understanding specific concepts. Rashi's commentary is used only sparingly, for informational purposes. Later on in the zman, the shiur will begin to focus more on understanding Rashi's approach as a commentator and mechadesh. Some of the comments and chidushim of Tosafot will also be included as time goes on. The shiur is appropriate for students with a range of backgrounds who want to improve their skills working with a page of gemara, and at the same time want to be able to participate in the gemara's world of midrashic understandings of the written Torah, halachic discussion, and aggadic ideas. Prior general background in Jewish studies is helpful, but not essential. This semester we will be studying Tractate Pesachim, Chapter 1. A basic-level gemara shiur that aims primarily to improve the student's ability to logically parse a gemara sugya. For the first months of the zman, the emphasis is almost exclusively on reading the gemara text, and using parallel gemara sources for understanding specific concepts. Rashi's commentary is used only sparingly, for informational purposes. Later on in the zman, the shiur will begin to focus more on understanding Rashi's approach as a commentator and mechadesh. Some of the comments and chidushim of Tosafot will also be included as time goes on. The shiur is appropriate for students with a range of backgrounds who want to improve their skills working with a page of gemara, and at the same time want to be able to participate in the gemara's world of midrashic understandings of the written Torah, halachic discussion, and aggadic ideas. Prior general background in Jewish studies is helpful, but not essential. This semester we will be studying Tractate Kedushin. A basic-level gemara shiur that aims primarily to improve the student's ability to logically parse and learn gemara sugya. For the first months of the zman, the emphasis is almost exclusively on reading the gemara text, and using parallel gemara sources for understanding specific concepts. Rashi's commentary is used only sparingly, for informational purposes. Later on in the zman, the shiur will begin to focus more on understanding Rashi's approach as a commentator and mechadesh. Some of the comments and chidushim of Tosafot will also be included as time goes on. The shiur is appropriate for students with a range of backgrounds who want to improve their skills working with a page to learn gemara, and at the same time want to be able to participate in the gemara's world of midrashic understandings of the written Torah, halachic discussion, and aggadic ideas. Prior general background in Jewish studies is helpful, but not essential. A basic-level gemara shiur that aims primarily to improve the student's ability to logically parse a gemara sugya. For the first months of the zman, the emphasis is almost exclusively on reading the gemara text, and using parallel gemara sources for understanding specific concepts. Rashi's commentary is used only sparingly, for informational purposes. Later on in the zman, the shiur will begin to focus more on understanding Rashi's approach as a commentator and mechadesh. Some of the comments and chidushim of Tosafot will also be included as time goes on. The shiur is appropriate for students with a range of backgrounds who want to improve their skills working with a page of gemara, and at the same time want to be able to participate in the gemara's world of midrashic understandings of the written Torah, halachic discussion, and aggadic ideas. Prior general background in Jewish studies is helpful, but not essential. A basic-level gemara shiur that aims primarily to improve the student's ability to logically parse a gemara sugya. For the first months of the zman, the emphasis is almost exclusively on reading the gemara text, and using parallel gemara sources for understanding specific concepts. Rashi's commentary is used only sparingly, for informational purposes. Later on in the zman, the shiur will begin to focus more on understanding Rashi's approach as a commentator and mechadesh. Some of the comments and chidushim of Tosafot will also be included as time goes on. The shiur is appropriate for students with a range of backgrounds who want to improve their skills working with a page of gemara, and at the same time want to be able to participate in the gemara's world of midrashic understandings of the written Torah, halachic discussion, and aggadic ideas. Prior general background in Jewish studies is helpful, but not essential. The first session for this class will be on April 29th. PLEASE NOTE: This class needs a minimum of 10 registered and paying students in order to ensure its continuation. A basic-level gemara shiur that aims primarily to improve the student's ability to logically parse a gemara sugya. For the first months of the zman, the emphasis is almost exclusively on reading the gemara text, and using parallel gemara sources for understanding specific concepts. Rashi's commentary is used only sparingly, for informational purposes. Later on in the zman, the shiur will begin to focus more on understanding Rashi's approach as a commentator and mechadesh. Some of the comments and chidushim of Tosafot will also be included as time goes on. The shiur is appropriate for students with a range of backgrounds who want to improve their skills working with a page of gemara, and at the same time want to be able to participate in the gemara's world of midrashic understandings of the written Torah, halachic discussion, and aggadic ideas. Prior general background in Jewish studies is helpful, but not essential. Please note that this class requires a minimum of 7 paying students in order to proceed. If this number is not reached, the class may be discontinued. A basic-level gemara shiur that aims primarily to improve the student's ability to logically parse a gemara sugya. For the first months of the zman, the emphasis is almost exclusively on reading the gemara text, and using parallel gemara sources for understanding specific concepts. Rashi's commentary is used only sparingly, for informational purposes. Later on in the zman, the shiur will begin to focus more on understanding Rashi's approach as a commentator and mechadesh. Some of the comments and chidushim of Tosafot will also be included as time goes on. The shiur is appropriate for students with a range of backgrounds who want to improve their skills working with a page of gemara, and at the same time want to be able to participate in the gemara's world of midrashic understandings of the written Torah, halachic discussion, and aggadic ideas. Prior general background in Jewish studies is helpful, but not essential. This class shiur aims primarily to improve the student's ability to logically parse a gemara sugya. For the first months of the zman, the emphasis is almost exclusively on reading the gemara text, and using parallel gemara sources for understanding specific concepts. Rashi's commentary is used only sparingly, for informational purposes. Later on in the zman, the shiur will begin to focus more on understanding Rashi's approach as a commentator and mechadesh. Some of the comments and chidushim of Tosafot will also be included as time goes on. 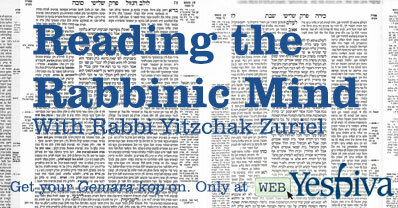 Reading the Rabbinic Mind: How to Understand Gemara- Shabbat "Klal Gadol"